Monster Jam is coming to Pittsburgh in February — and the students in SAEM Assistant Professor Paige Beal's Marketing and Promotions class are gaining hands-on experience creating marketing plans for this upcoming event. Beal's class is working directly with MaryAnn Bagnoli, director of event marketing and sales for the Northeast division of Feld Entertainment. The students' final marketing plans for Monster Jam will be presented to Bagnoli and Beal in early December. "MaryAnn is super busy as a director of event marketing and sales yet she set aside time to meet with my class and prepare this project with me," said Beal. 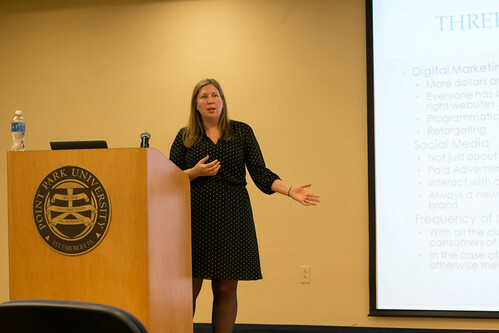 Most recently, Bagnoli guest lectured to SAEM students in a special workshop session on the strategies behind marketing large-scale events and gave students advice on how to land careers in the event management field. "I learned that event management work is extremely rewarding because you get to help produce an event and then see the final product and how much people enjoy it," remarked Madeline Bartos, a freshman SAEM major. "We talk about in class how important connections are so it was interesting to hear how much MaryAnn's connections helped her land the jobs she has had," said SAEM freshman Cassie Crisp. Prior to working for Feld Entertainment, Bagnoli was marketing director of the Capitol Repertory Theatre, marketing and media strategist for TD Garden and associate marketing manager for Broadway in Boston. "In speaking with the students, MaryAnn reinforced the similarities in all of her positions even though they are in different entertainment mediums. She also emphasized the importance of having a strong work ethic and the ability to take on new tasks and challenges," explained Beal. "What I enjoy about Professor Beal's class are the different guest speakers we have and all of the information she gives us on various SAEM topics," said Kieran Phoenix, a freshman SAEM major. "I also like how we often work in groups and teams just like we would in the business world." Crisp added: "Point Park gives us so many connections through job shadowing, volunteering and internships. The professors are amazing at what they do and connect us with so many people they know. It's nice to know I have professors who want me to succeed and support my dreams."